Non-contact, Non-Deflating, Hi Tech Protection For Your Vehicle. 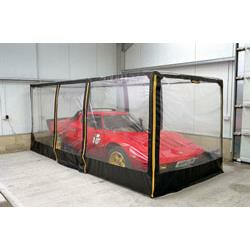 Airchamber is a unique, lightweight construction designed to protect your cherished vehicle from the damaging effects of damp and dust. The hi-tech static trap filtration system removes all abrasive particulates from the atmosphere, whilst the twin fans keep air circulating to prevent moisture from settling on the paintwork. Does not collapse when not in use - drive in, zip up, switch on! Are you likely to be replacing the vehicle at some point for a bigger one!